The gang’s all here in this X-Men, X-Factor, New Mutants, X-Terminators and Excalibur pin-up! Adams’ trademark Wolverine is front and center in this dynamic piece! A cool look at an X-Babies preliminary drawing from 2002 showcases Colossus, Dazzler, Longshot, Psylocke, Storm, Havok and Wolverine as l’il tykes! A lovely sketch of classic Storm. Whoever Jim is, he’s a lucky fella! 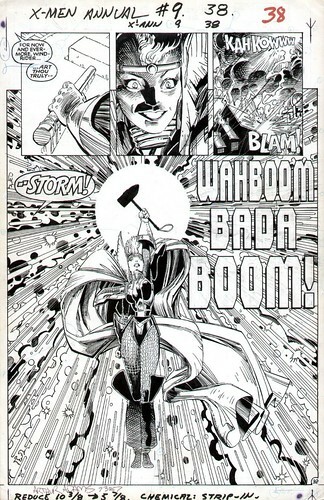 Mohawk Storm from X-Men Annual #9! Storm stars in New Mutants Special Edition #1! First and second generation of X-Men gather ’round for the cover of Classic X-Men #1! This cover to Marvel: Year In Review features the 90s X-Men! That’s all for today! There’s more awesome Art Adams artwork still to come!